A former student at Wolverton Grammar School reminded me recently about Latin and its place in the curriculum. He didn’t do very well at it (few of us did) and fifty years later he still regarded it as a waste of his time. you needed it to get into some universities and particular university courses. The last arguments were the ones which may have had some resonance. Universities at that time required Latin for some courses and I think Oxbridge required it for university admission. The so-called Redbrick Universities were a little more relaxed about it. Looking back (although I didn’t consider this at the time) Latin may have been quite new at WGS. I don’t see Latin appearing on my Mother’s School certificate from the 1930s so it certainly wasn’t general. Somehow, Latin must have been acquired by those who got scholarships to Oxford. I am not sure how this was done. Miss Lidster, our Latin teacher, looked as if she had been there for some time but may have arrived after the war when Wolverton County School became a Grammar School. Latin for us began in the second year and continued to O Level. Miss Lidster was the only Latin teacher and taught up to and including 6th Form. The difficulty we had with Latin was that it didn’t appear to relate to anything in our world. We had young open minds and could, for example, relate to learning the Periodic Table or Ohms Law. These things had some modern relevance, but the Latin we were taught was a language frozen in time. There were declensions to learn, verb conjugations and tenses, gerunds and gerundives. There were imperfect, perfect and pluperfect tenses. Nouns had different endings for the nominative, accusative, genitive, dative and ablative cases. It appeared to be a very complex way of organising a language. There was no common agreement on pronunciation after 2,000 years. Miss Lidster favoured the convention of pronouncing “v” as “w” and the “c” was always hard. Thus “victor ludorum” was pronounced wictor ludorum. Of course English had travelled over the centuries by dropping inflexions. Words in English were at one time modified according to how they were used in a sentence, but over 2000 years the language had adapted to a more modern, more practical expression, where word order, rather than word ending established the meaning. So this was the challenge, even to quite bright, receptive minds. We could have made sense of it, with effort, but without seeing the point, many of us remained unmotivated. 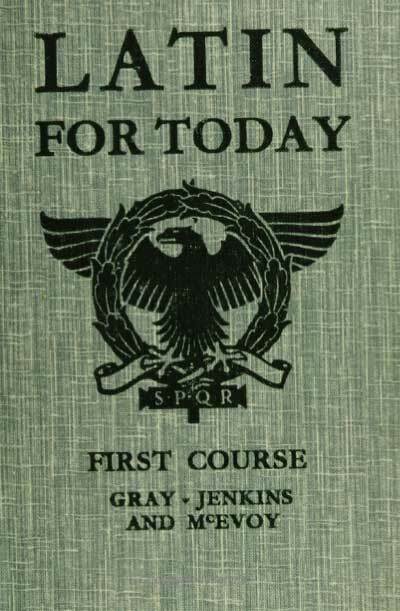 Today, Latin is scarcely taught in schools anywhere. Was it useful? If I see an inscription or phrase in Latin today I can more or less work out the meaning., At an academic level the knowledge is of some interest and I can tell the Latin roots of words used in the English language. I discovered once, when I was in Caracas, Venezuela, that I could read the newspaper in Spanish and make sense of it. But it hasn’t much entered my daily life. I would slot it in with quadratic equations, the use of logarithms and differential calculus – all of which I learned at school, but have never used since. 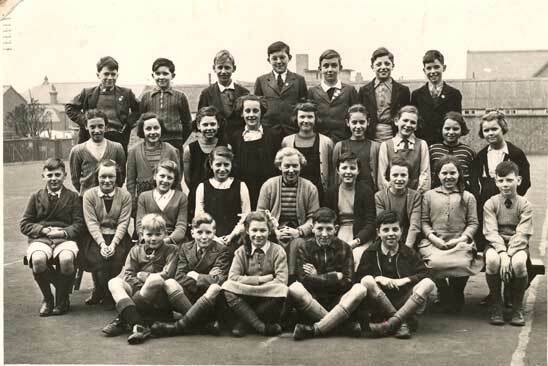 1954 Another panoramic photo from the days of gym-slips and short trousers. 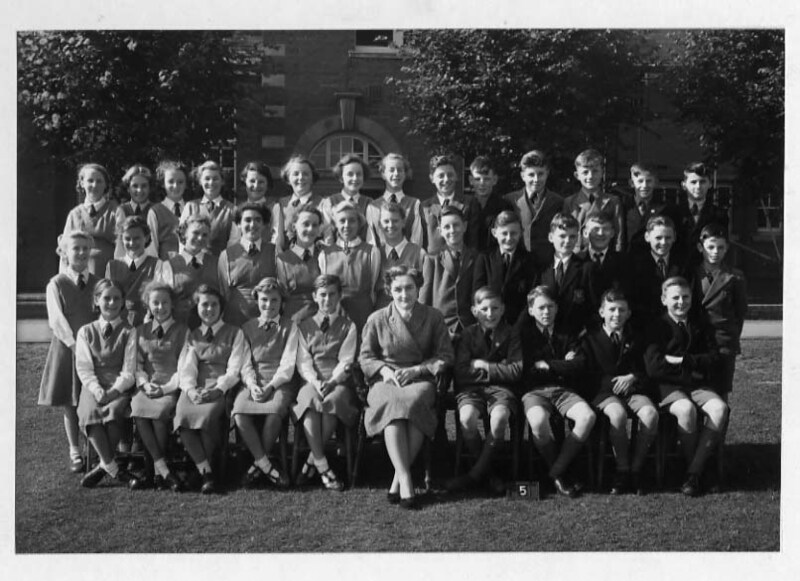 In 1954 the school decided to abandon the whole-school panorama in favour of class photos. I suppose the Headmaster thought that this plan was less disruptive, although the panorama returned the following year due to popular demand. Our class was called 2M – M for Metcalfe, who was out French teacher as well as our Form teacher. Christine Metcalfe was the daughter of a Lincolnshire farmer who had studied French at a French University and was much more lively than her senior French teacher, the wooden Mr Thomas who had been at the school since my mother’s School Certificate year – 1931. Miss Metcalfe was a breath of fresh air after that. A couple of years after this photo wastaken she married Harry Johnson, a Biology teacher who came to us (I think) in January 1955. Our first year Biology teacher was Miss Jones. She left and was replaced by a Mr White who was so terrified of us that he spent the entire lesson scribbling notes furiously on the blackboard leaving us to desperately catch up. His tenure was short-lived and I would guess that he was quietly advised to move on. Mr Johnson was a very different kettle of fish; he wasn’t terrified of us – we were scared of him! I should add that we had no text books in those days and notes taken from the teacher were our only record of new knowledge.